Humans require vitamin B-12, and only animal products reliably provide natural bioactive vitamin B-12, therefore we must be adapted to and dependent upon meat-eating. I have since realized that I made a few mistakes here. Although we definitely require B-12, animal products are not the only reliable sources of natural bioactive B12, and human B-12 metabolism provides evidence that our ancestors adapted to an environment/diet that had a low availability of B-12 compared to currently recommended daily reference intakes. What kind of environment/diet would naturally favor the survival of humans having such efficient recycling of vitamin B-12 but not of other B-complex vitamins? As a general principle, if an organism subsists on a diet with a low availability of a certain essential nutrient, it needs mechanisms for increasing absorption and retention of that nutrient, to prevent deficiency. On the other hand, if an organism subsists on a diet with a very high availability of a certain essential nutrient, then it needs mechanisms for reducing absorption, detoxifying, and eliminating that nutrient. 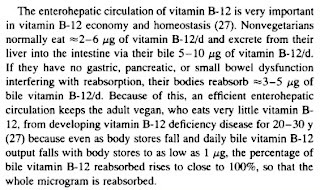 Put in natural selection terms, only an ancient environment/diet with a low B-12 availability would have favored the survival and reproduction of humans who could recycle B-12 very efficiently. 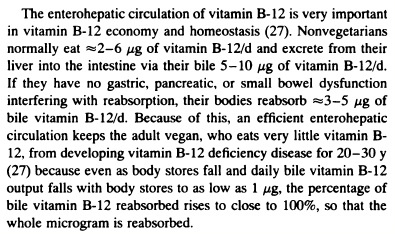 An ancient environment/diet with a high B-12 availability would have made such a capacity unnecessary; on the contrary, an environment with a high availability of vitamin B-12 would have favored those who were less efficient at using B-12, or those who deliberately excreted excessive B-12 (in order to prevent B-12 accumulation and toxicity). Thus, modern human B-12 metabolism suggests that modern humans are adapted to a diet that provides B-12 in less than required amounts on a daily basis, while occasionally providing larger doses in excess of requirements. Three ounces of beef or salmon provides the recommended intake, and three ounces of shellfish substantially exceeds the recommended 2.4 mcg. In contrast, one would have to consume 24 ounces of chicken or turkey daily to ingest 2.4 mcg of B12. As I said above, I previously accepted that only animal products reliably provide natural vitamin B-12. Although this is a common belief, and probably a good general rule in modern industrialized nations, I think we have significant evidence that pre-industrial humans had other significant sources of vitamin B-12. First, although animal products provide the most common vector for delivery of B-12 in modern industrialized nations, only microbes produce vitamin B-12. Many microbes have the ability to produce B-12, among them the following genera: Aerobacter, Agrobacterium, Alcaligenes, Azotobacter, Bacillus, Clostridium, Corynebacterium, Flavobacterium, Micromonospora, Mycobacterium, Norcardia, Propionibacterium, Protaminobacter, Proteus, Pseudomonas, Rhizobium, Salmonella, Serratia, Streptomyces, Streptococcus and Xanthomonas. In 1994, Mozafar reported that spinach leaves and barley seeds grown on soil fertilized with organic matter or isolated B12 take up vitamin B12 into their tissues from the soil. The spinach leaves and barley kernels were thoroughly washed with distilled water before being tested for B12 content, so this was not a case of finding B12 on soiled plants. Their testing confirmed that these plants contained active B12, not inactive analogues. In summary, it appears that non-pathogenic soil microbes, human small intestinal bacteria, lactobacilli from fermented foods, some sea algae, common mushrooms, and plants grown on soil fertilized with animal manure can all can provide biologically active B12. Any of these could have served as ongoing sources of B12 for prehistoric human ancestors, but modern circumstances may make these non-animal sources of B12 unreliable for modern humans. I think it safe to assume that our prehistoric ancestors had more contact with soil than we do, sitting on it, sleeping on it, digging in it, and drawing water from sources in contact with the soil. Humans like other primates are apt to touch their own lips from time to time, providing a vector by which soil microbes could enter the human gut. Humans living in modern industrialized nations typically ingest multiple courses of oral antibiotics over a lifetime, reducing or eliminating the population of B12-producing bacteria residing in the small intestine. All of our prehistoric ancestors would have been breast fed and probably kissed often, which transmits flora from one generation to another, and this transmission would not have been interrupted by antibiotic treatments. Fermentation of plant foods, particularly fruits, occurs spontaneously in nature, providing another route by which our ancestors may have ingested B12-producing lactobacilli. Our ancestors almost certainly consumed any edible wild mushrooms and all of the plants they ate grew in soils teaming with bacteria and fertilized by fermented organic wastes, providing another B12 source. All of this information suggests that modern hygiene, indoor lifestyles, antibiotics, and use of chemical rather than biomass fertilizers in farming have reduced the amount of B12 available to humans in modern urban environments from non-animal sources. Thus, the low availability of B12 from non-animal sources in modern urban environments is an artifact not reflective of preindustrial environments, and it appears probable that our prehistoric ancestors had more non-animal sources present in their environment, like the southern Indians studied by Albert et al. When I previously argued that meat-eating is the 'natural' way to get B12, I committed the fallacy of appeal to nature. The problem here lies in these underlying assumptions: 1) all 'natural' behaviors are 'health-promoting' behaviors for modern urban humans, and 2) all 'unnatural' behaviors are unhealthful. Is it natural for humans to live in igloos in the arctic circle? Does living in igloos in the arctic circle promote the best of health? Is it natural for humans to live in natural caves? Do humans have the best possible health when living in natural caves? Is a natural cave the best possible human shelter? Is it natural for humans to commit homicide, engage in war, or eat human flesh? Do any of these promote health? But is the 'natural' choice of our ancestors the best possible choice for modern humans of the present day? Simply put, the fact that our ancestors did something then does not tell us that it is the best thing for us to do now. The fact that our ancestors obtained B12 by a 'natural' route (eating meat) does not tell me that this is the optimal way for me to get B12 in our modern circumstances. In other words, we cultivate, feed and breed living microbes so that they will produce the nutrient we want. This practice seems similar to cultivating cattle to produce protein or B12. If the former is ‘artificial,’ so is the latter. Tablets of microbially synthesized B12, burgers of ground beef, capsules of vitamin D extracted from sheep’s hair, and tortillas made from corn are all end products of humans processing a raw material into a form that humans can conveniently consume. If you reject B12 tablets as ‘unnatural,’ you should similarly reject ground beef burgers and vitamin D capsules. The information above indicates that modern antibiotics and hygiene have reduced or eliminated intestinal flora that would otherwise produce B12 for us, and modern agricultural practices have reduced the B12 content of plant foods. Similarly, modern indoor lifestyles have reduced our endogenous production of vitamin D. We can reasonably use supplements to correct for these technology-induced deficiencies. In short, B12 supplements are the most reliable source of natural B12 in the modern environment. So these sources do not consider animal foods to be reliable sources of B12 for those of us more than 50 years of age. Do we reject this advice because it is not 'natural' to take supplements? Modern humans typically use their minds to identify their requirements for health and comfort, then develop and use appropriate technology to provide those requirements in the most efficient, safest possible way. Thanks to microbe-ranching, each modern urban human now has the opportunity to decide which of at least 3 courses s/he would prefer to take to ensure achievement of a healthy B12 status. Course 1: Obtain B12 directly from a cultivated microbial source, the production of which requires relatively little land and water and produces no urine or feces. This source is free of saturated fats, cholesterol, heterocyclic amines, lipid peroxides, pathogenic organisms, or antigenic Neu 5Gc sialic acid (a suspect in human cancers and autoimmunity, found only in mammal’s products, 13 ). As noted above, current science indicates that Course 2 is probably not reliable for people more than 50 years of age. Course 3: Use both B12 supplements and animal products. Take your pick, or perhaps you will discover another way. Thanks to the author/producer of the Primitive Nutrition video series for alerting me to the article on the B12 content mushrooms used in this post. I was inspired some months ago by your post on Shamanism as evolutionaru medicine, now I'm not unsubscribing from your blog as I'm convinced it's all a big joke and you are just having a lot of fun. It's natural for a former vegan like me to take one look and say, "Good Luck Don!" Been there, done that. The only difference is I gratefully remember the experience. Once again, i see a lot of things to agree with. It's clear that B12 do not prove we evolved to eat a meat based diet. It does not prove, either, that we evolved to eat no meat. Things get worse at the end. Do you re-read course 1 vs course 2 ? Don't you think you're overly caricatural ? Don, you call to Tao, Buddhism... all things i respect, as a practicer of meditation. But where do you put your mind when it comes to food ? You know there is no evil or god food, no pure black nor pure white... how your philosophy of life can make you draw so ultrasimplistic, caricatural and extremist conclusion when it comes to food ? So, we should supplement b12 instead of consuming small amounts of animal produce? Your last post on b12 was much better don. This smacks of vegan propaganda, especially the last bit with the 2 scenarios. Why go on about yin and yang components of the diet when it seems you are prepared to even supplement to avoid animal foods. Doesn't sound very balanced.. This is the most thoughtful take on B12 I've seen to date. I love your Socratic approach to the appeal to nature, too. I hope that helps a few people. What is optimal, though? Don't most people benefit from high dose B12 supplementation, especially into old age? Where would that be found other than organ meats? 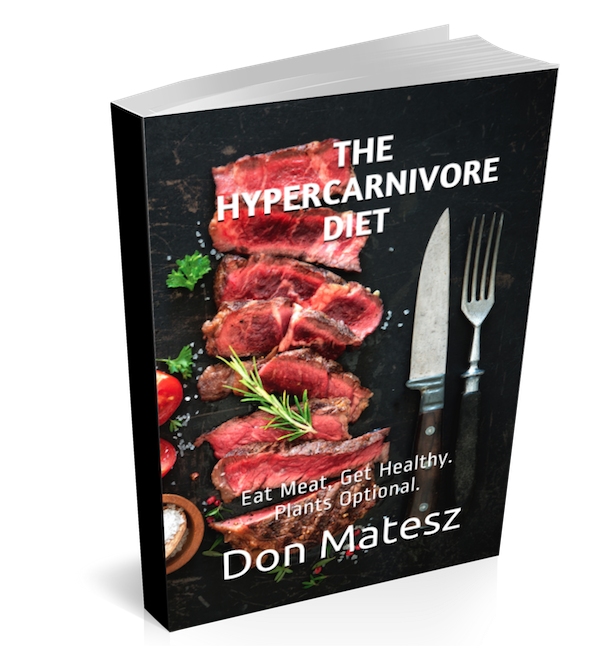 Don you should change your diet guide to gatherer diet guide as its not hunter-gatherer. I can't believe you have completely removed all animal products. so, is the cyanocobalamin found in synthetic B vits from cultivated microbes? I second the question regarding the type of B12 that is recommended in your opinion. The B12 in supplements comes from cultivated microbes. If talking about supplements, I recommend active cobalamin. I have not seen any evidence that cyanocobalamin in supplements is inferior to any other form.